Size: Among the smallest of Texas serpents, adult rough earth snakes are generally 7 – 10 inches in length. Description: Uniformly olive-brown, reddish brown, dark gray, or nearly black with cone-shaped head. Habitat: Any region with damp soil, pine woods, hardwood forest, sparsely wooded rocky hillsides, swamp edge, and grasslands. It usually avoids desert of semi desert habitats. Behavior: Rough earth snake have never been known to bite. Response when discovered on the ground is to lie motionless or play possum when disturbed. Feeding: The diet of such a small snake consists largely of invertebrate prey. Feeds almost exclusively on earthworms, though ant larvae may also be taken. Its pointed snout facilitates burrowing in the moist soil where its prey is found. 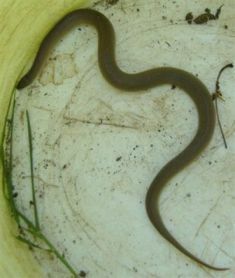 Only earthworms were found in the sampled stomachs along with a wider range of menu items that includes slugs, snails, sowbugs, insects, small frogs and your lizards, particularly the abundant little ground skinks. Insect eggs and larvae may be eaten as well. Notes: There is no snake repellants. Some suggested novice tips are the use of vibration or electric, or hot pepper, mustard. Non-venomous snakes are usually good. This snake does eat earthworms.